I qualified as a Dental Hygienist from the University of Gothenburg in Sweden in 1999. I have over 17 years of experience in mixed and private dental practices. I take great pride in my profession and lucky to have built a large patient base with great rapport over the years. I take my job very seriously and my patients trust me with their oral health. 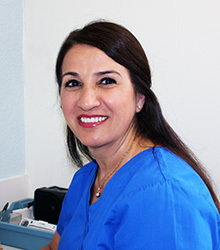 I thrive to make my patients happy and work very hard to prevent, treat, maintain and cure periodontal diseases. My 3 main strengths as a hygienist are treating nervous patients, performing non-surgical RSD to the level of a periodontist and I have a high patient recall rate; patients listen to my instructions very well and always re-book.